This is a special event. All registrations on Eventbrite. 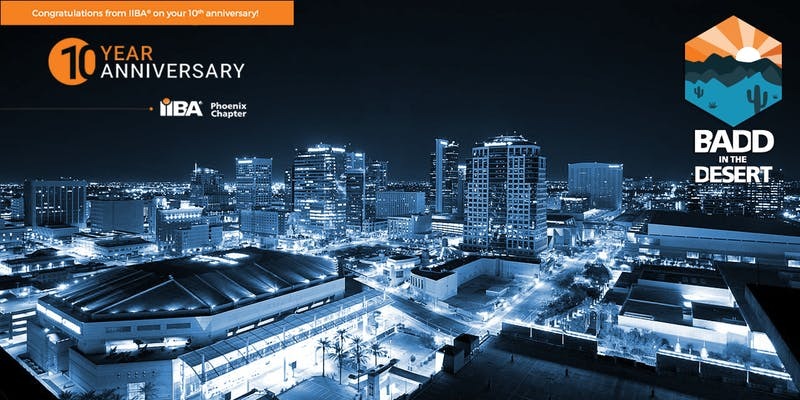 The Phoenix IIBA Chapter is excited to host the first professional development day in the area specifically geared toward business analysts. This will be a fantastic learning opportunity for you to expand your skills set, learn about the latest industry trends, and network with your colleagues. You will also be eligible to claim up to six CDUs and PDUs for attending. We are happy to be able to bring this value-packed developmental event to the greater Phoenix area. The BA role has become more prominent, and the ever-changing requirements and opinions of what a business analyst is has importance in the success of major projects. Enterprises depend on business analysts to propel products and projects while connecting team members. This event focuses on the future of the business analyst role, while giving educational advancement as well. The theme of the BADD in the Desert is Business Analysis in Transformation. Throughout the day attendees will have the opportunity to participate in 4 different tracks, including Agile, Practitioner, BA Trends, and Professional Skills. BADD in the Desert is a technical conference for business analysts, project managers, IT managers, and anyone else, whether expert or beginner, involved in technology. Customers are not paying for your product, they are hiring your product and are paying for positive outcomes and impacts. Agile was marketed with promise of faster value delivery to customer but as it went mainstream many organizations focused only on mastering different elements of agile frameworks and progress is being measured by vanity metrics such as velocity and burndown charts leaving customer success sideways. Organizations and teams must realize that while “speed to launch” is crucial “speed to learning” is even more important as they deliver features and products. How we respond to these learning's can drive a radical change in focus from “Velocity of Story Points” delivered to “Velocity of Learning” gained and answering the fundamental question of “Is our Customer Winning?”. To accomplish this mindset shift, Product Managers and business analysts need to learn to move their focus from mastering the art of writing perfect user stories to connecting their teams with the users of their products and the "problems & challenges their customers are trying to solve”. Taking teams to the next level of making the customer successful through continuous delivery of valuable product requires an alignment between the product managers, analysts, engineering team and their customers. It requires the product managers and analyst to understand the difference between product success and customer success. Register today for the BADD-D event - Early Bird Discounts End August 21 This is a special event. All registrations on Eventbrite.